Symbiosis Faculty of Media and Communication fosters the highest standard of training and inquiry into the multi-faceted needs of the media and communications industry. Our strong academic programmes are driven by rigour, scholarship and a healthy integration of theory and practice that translate abstract ideas into tangible forms. Dr Ruchi Kher Jaggi is a PhD in Media Studies from the University of Pune. She has been teaching undergraduate and postgraduate courses for more than 13 years now. Her areas of specialization are Culture Studies, Communication Theories and Qualitative Research Methodology. 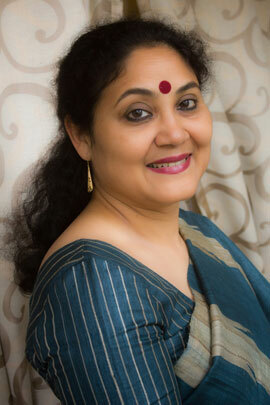 Dr. Ruchi Kher Jaggi is a PhD in Media Studies from the University of Pune. She has been teaching undergraduate and postgraduate courses for about 13 years now. Her areas of specialization are Culture Studies, Communication Theories and Qualitative Research Methodology. Her research interests include media representations, popular culture analysis, gender studies, television studies, and emerging discourses of identity on new media. She has authored text books, several book chapters and has published her research work extensively in national and international journals. She is a member of several international consortia on media and communication research as well as is on the editorial boards of reputed journals and conferences. - managing creative businesses- MBA(CM). We bridge the traditional and the contemporary; with our feet on the ground and fingers on the pulse. That is why our curriculum has both research and digital tracks built into it. We have carefully built an ecosystem that allows for contrasting opinions, methods and processes to co-exist and deliver. Co-locating instruction, exploration, process and instinct, we believe, is a good mix for academic progress. We are also the largest Post graduate institute in the Media and communication space. Each one of our specialization areas is either ranked 1 or 2 as per published rankings. Dr Triveni Goswami Mathur is a Fulbright – Nehru Scholar, with a total experience of 27 years in the field of academics and the media industry. 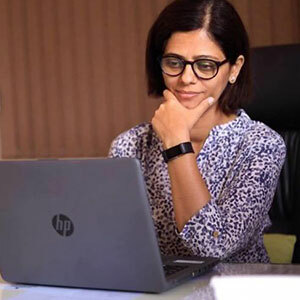 A Ph.D in Media and Communication from University of Pune, she held the position of Deputy Director, Symbiosis Centre for Media and Communication, Pune. Triveni has been teaching core courses in Journalism, Media Research Methods, Contemporary India and Media Perspectives and Gandhi and Peacemaking to both the undergraduate and post-graduate level students in India and the USA. During her tenure as a Fulbright scholar, Triveni was affiliated to the Mary Baldwin College (now Mary Baldwin University) in Staunton, Virginia where she designed and delivered an Asian Studies course on Contemporary India with special focus on ethnic and cultural diversity and media perspectives on social action. She co-taught a Communication course on Introductory Media and a course on Gandhi and Non-Violence in the Philosophy department and developed a ‘student led discussion teaching guide’ for the Gandhi and Nonviolence course for future use. She also conceptualized and edited a collection of students’ responses to the meaning of peace in a booklet titled “The Courage to Embrace Peace” during her tenure at Mary Baldwin. Besides speaking at an international panel discussion on “Women and Global Peacemakers”, Triveni engaged students across specializations and delivered guest lectures in departments of Social Work, Masters in Teaching program, Criminal Justice Program, Master of Fine Arts Program, Inter-Faith religion department and public lectures on Contemporary India issues. She was invited to deliver ‘Media in India’ lectures in the Winthrop University through the Fulbright Occasional Lecturer Fund and also engaged in lectures and discussions with students and faculty of James Madison University and Blueridge Community College on ‘Gender and Media’ in India. Besides, addressing a diverse age group on topics of interest about India, she also participated in the Fulbright Enrichment Seminar in New Orleans and other Fulbright Association engagements in Virginia besides being invited as a special guest to a community event honouring peacemakers with the “Mahatma Gandhi Award” at the James Madison University. Also a Rotary International Scholar, she has held several senior academic positions including Board of Studies member in leading educational institutes like Symbiosis International (Deemed University), Dibrugarh University-Assam,, St Mira’s College for Girls, Syllabus Committee for Vocational Course in Fergusson College, Pune, and a visiting professor and faculty research guide at The Alliance for Global Education - India (HQ Washington DC), and institutions affiliated to Pune University. She is an Editorial Board Member for Virginia Review of Asian Studies, USA. An author, translator, editor with published work, Triveni was also an Independent Director on the Board of Directors of Johnson Controls Automotive Ltd, a leading automotive component multi-national company. At SSMC-B, learning is a participative and interactive activity. The Curriculum is contemporary, fluid, dynamic and totally industry driven. The state of the art, expansive, inviting ambience of SSMC-B has all the facilities that a top- notch Media and Communication Professional Institute needs. SSMC-B aims to serve the multi-faceted needs of the Media and Communication industry in particular, and the society in general, through education, training, research and advocacy. It seeks to develop competent, responsible and innovative professionals in the practice, development and management of Media and Communication. The academic program is holistic - involving group discussions, case studies, seminars and workshops, live projects, NGO Internships, besides summer and winter Internships. Equal emphasis is laid upon curricular, co-curricular and extra-curricular activities. Ranked as India's Best Mass Communication College by the annual surveys conducted by India Today & Nielsen Company in 2013, 2014, 2015, 2016 & 2017. In 2012, it was ranked as India’s Second Best Mass Communication College. Symbiosis Center for Media & Communication (SCMC), has been successful in carving a niche for itself in the field of Media and Communication education since its inception in 2008. The definition of media has undergone a radical change in recent times. The shift is not merely technological but that of perception of society about media and the awareness of the potential that lies in the active participation in the creation of media. The potential to transform society by challenging and changing the norms constantly, by resorting to the voice that is present within us, to express what is felt and it is this active expression which makes us human. At SCMC, we cohere ideas together and give it powerful voice and a shape. This crystal ball of consciousness has the ability to not only see but also bring a positive change in the future through its continuous evolution. Armed with the technology and brewing creativity of relentless contemplation, we pride ourselves to be the leader in media education. Thus, striving to transcend the apogee reached by us every step of the way. Through our programme, Bachelor of Arts (Mass Communication), we offer a comprehensive experience through traditional academic learning & research with cyber & experiential learning. Dr. Sreeram Gopalkrishnan has a PhD in Mass Communications, MS in Communications, MBA from NMIMS and has attended Executive Programmes at the IndianOil Institute of Petroleum Management and Mudra Institute of Communications & Advertising(MICA). He has a UGC NET lectureship in Communications and published research papers in leading peer-reviewed and Scopus indexed research journals. Dr Sreeram has over 26 years’ experience in the corporate sector and has been in academics in the past three years. He started his career in the IT Industry before getting into the media as a Scriptwriter/ Copywriter in companies like OS Studios & RK Swamy BBDO. He joined Fortune 500 company IndianOil as a Probationary Officer and worked in senior leadership positions pan India before shifting to the Atharva Group. In 2016, he received the prestigious Best MBA Faculty award from the premier Bombay Management Association, the apex body for B-Schools in Mumbai. In 2017, he joined Symbiosis International University as Associate Professor and is presently the Officiating Director at Symbiosis Centre for Media and Communication. He is also a visiting faculty at the Symbiosis Institute of Business Management at Pune teaching a course on Film Marketing. Dr.Sreeram research interests are in Lobbying Studies, CRM, Branding, Film Studies and Marketing Analytics and he has also contributed two books – Petroleum Perspectives and the Future - published by the D.Y.Patil Foundation & Cloud Computing: The Surge before the Storm by Cambridge Publishing, UK. 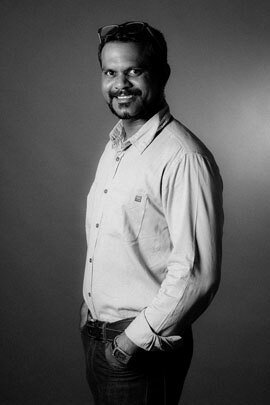 Nithil Dennis has 17 years of combined experience in both academic and industry and holds a Degree in Visual Communication, specialising in Photography from Loyola College, Chennai and a Masters in Electronic Media, specialising in Film and television production from Anna University, Chennai. Nithil Dennis has 17 years of combined experience in both academic and industry and holds a Degree in Visual Communication, specialising in Photography from Loyola College, Chennai and a Masters in Electronic Media, specialising in Film and television production from Anna University, Chennai. He also has a 3-year Diploma in Printing Technology. He is also a UGC-NET qualified Lecturer. He is a qualified and experienced academician with 13 years of teaching experience in various specialisations of Photography & films. He has worked in leading educational Institutes holding various important positions and responsibilities. He has a strong sense of identifying photo stories. His research Interests are 'Digital Storytelling through Images' and 'Participatory approaches with the help of Digital Imaging Technologies and its uses in the representation of Ethnographic Communities in India'. He has been working extensively with ethnographic communities in Southern India as part of his Research. He has worked with leading photographers and filmmakers, which include International Award-winning Environment and Wildlife filmmaker and photographer Mike Pandey. 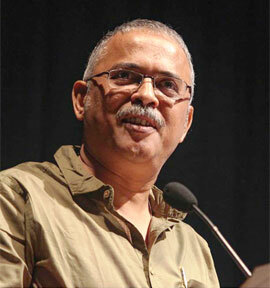 He has directed and filmed two documentaries, which have been screened in International Film festivals. He has directed and photographed a documentary series 'Unlocking Lives', an NDTV based show, with topics ranging from Tran sexuality, single women, gypsies, expats, male Bharatanatyam dancers and theatre personalities. He also has worked with leading Photographers in various advertising campaigns and has done an International Internship in Argentina as a photo and video journalist for a leading News Website based in Buenos Aires. He has experience in all spheres Visual production and communication and as an ardent photographer loves to travel and document various cultures, traditions landscapes and people. Photography is likened to a multi-disciplinary skill. One that calls upon the practitioner to exercise creativity, science and art. And for this art form to flourish, it needs to be taught in a conducive environment and by a faculty worthy of their repute. Hence under the auspices of Symbiosis International (Deemed University), a first-of-its-kind venture has taken shape; the Symbiosis School of Photography. A venture as unique as it is bold, the Symbiosis School of Photography was formed with the intent to cultivate talent in this art form and to infuse passion for photography. The Symbiosis School of Photography offers its students a 3 year Degree programme Bachelor of Arts (Visual Arts and Photography). The course is designed with a holistic approach instead of just technical skills. Situated at the picturesque Lavle hilltop campus in Pune, overlooking a sensational valley, with a spacious indoor studio equipped with advanced equipment, library and a digital post production lab. Website last updated on : February 16 2019 11:52:15.